1921 – Pierre Clostermann, French World War II pilot, was born. Colstermann was a French flying ace, author, engineer and politician. 1937 – First flight of the Mitsubishi Ki-30 (Allied reporting name “Ann”). It is the first Japanese aircraft to be powered by a modern two-row radial engine. 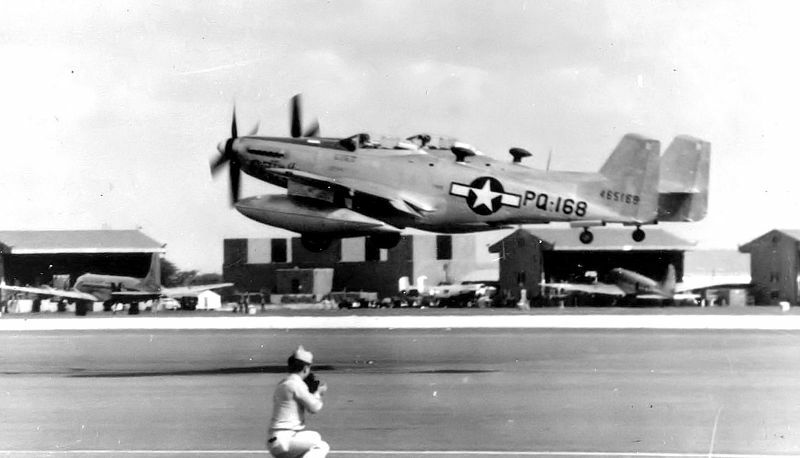 1947 – U. S. Army Air Forces Captain Robert E. Thacker (pilot) and Lieutenant John M. Ard (co-pilot) in the North American P-82B Twin Mustang fighter Betty Jo (shown above) on a single flight make both the longest nonstop flight without aerial refueling by a fighter aircraft, 4,968 statute miles from Hickam Field in Hawaii to La Guardia Field in New York City, and the fastest flight between Hawaii and New York City up to that time, 14 hours, 31 mins., 50 secs., at an average speed of 342 mph. It remains both the longest non-stop flight by a piston-engined fighter and the fastest Hawaii-to-New York City flight by a piston-engined aircraft in history. 1983 – W. O. John Croker became the first service man in the Canadian Forces to exceed 10,000 hours on a Lockheed C-130 Hercules. 2005 – (Feb. 28-March 3) Steve Fossett completes the first solo, nonstop, non-refueled aerial circumnavigation of the globe by airplane in a jet-propelled airplane specially designed for this event. 2009 – Carpatair Flight 128, a Saab 2000, lands at Traian Vuia International Airport, Romania, with the nosewheel stuck in the raised position. An emergency landing is successfully made on a partially foamed runway.